Not all patients are suitable for EVAR due to anatomical limitations. If this is the case, conventional open surgery can be performed. Prior to EVAR, all patients need a high-resolution CT scan and a baseline set of blood tests. Most patients also require an echocardiogram (ultrasound of the heart). Some patients require respiratory (lung) function tests. You will be seen by an anaesthetist before the operation for assessment and review of all test results. Bring a small suitcase with you to the hospital in preparation for a one to two night stay. Mr Milne will analyse the CT images using 3D remodeling software. This allows him to carefully plan for the procedure and select the most appropriate endograft components to suit the anatomy. The procedure is performed under general anaesthetic. In high-risk patients, it can be done under local anaesthetic. In most cases, the entire procedure can be performed percutaneously via needle puncture and sheath access in to the femoral arteries in each groin. Occasionally, small incisions are required to expose the femoral arteries for access. Under X-ray guidance, wire access is achieved from each groin in to the aorta. Angiograms (contrast dye injected in to the blood stream) are performed at different times during the procedure to define the precise anatomy and locate the seal zones for the endograft. The 'main body' of the endograft is then introduced under X-ray guidance and deployed just below the renal arteries. This creates a seal in the 'neck' of the aneurysm. The two 'limbs' of the endograft are then introduced in sequence and deployed to bridge between the main body of the endograft and the seal zones in the left and right iliac arteries (which supply each leg). Once the endograft is deployed, a balloon is inflated in the seal zones to ensure a tight seal. A final angiogram is performed to confirm that the aneurysm has been excluded. Closure devices are deployed in each groin to close the arteries. If groin incisions are used, the wound is closed in layers, the final layer comprised of dissolvable sutures under the skin. You will return to the vascular ward for monitoring after the procedure. It is advisable to rest in bed on the day of the procedure. On the first day after the procedure, you will be able to mobilise. A plain X-ray and an ultrasound of the abdomen will be performed to check on the endograft. You will normally be discharged home after one or two nights in hospital. Occasionally, a longer stay is required if there is concern over the groin wounds or if further monitoring is required. You will be scheduled for a review appointment with Mr Milne 4 - 6 weeks after the procedure, at which time a surveillance ultrasound will be performed. It is important to appreciate that lifelong follow up is required after EVAR, with an annual ultrasound and X-ray to check on the endograft. Our office will remind you of this each year. If the procedure has been done percutaneously, it is advised to wait at least 2 weeks before driving a motor-vehicle following EVAR. If incisions are required in each groin, it is advised to wait at least 4 weeks. You may travel short distances, under 4 hours, 2 weeks following the procedure. It is ideal to avoid flights/train/car travel over 4 hours duration for 4-6 weeks following the procedure. It is important to stay hydrated and walk around the cabin regularly whenever flying. Some minor ooze can occur in the groin wounds following the procedure. It is usually amenable to compression and is self-limiting. Major bleeding from a site of arterial access in the groins is rare (~1%). If it occurs, it requires a trip to theatre to formally repair the artery. The risk of an infection involving one of the groin wounds is ~1 - 2%. This type of infection usually resolves with a course of antibiotics. Most of the time, endoleaks occur due to blood entering the aneurysm via small vessels connected to the aneurysm sac (a type II endoleak). Type II endoleaks are usually benign and do not require intervention. 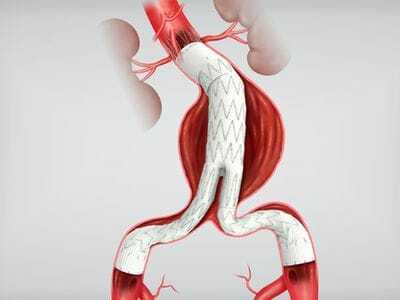 However, if they are associated with enlargement of the aneurysm sac over time, they require treatment, usually endovascular (minimally-invasive). Other types of endoleak are less common, but more serious. They are associated with blood leaking through the seal zones of the endograft. They require prompt treatment. They include heart attack, stroke, kidney dysfunction, chest infection, clot in the deep veins (deep vein thrombosis - DVT) and clot in the lungs (pulmonary embolism PE). The risk of a complication occurring during EVAR requiring conversion to a conventional open AAA repair is rare (~1%).